I will look at how Amazon.com can be helpful and how they can be mis-leading. 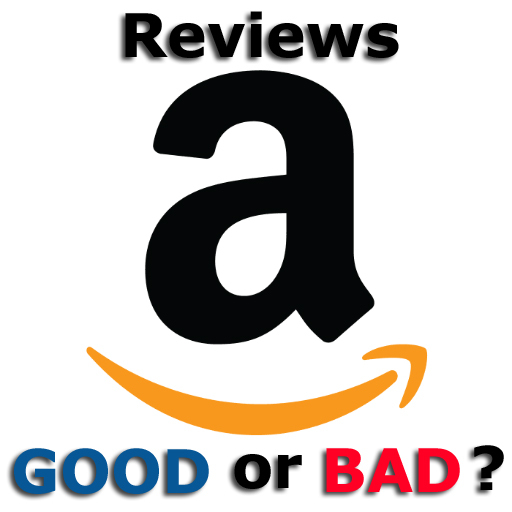 The point of this article is to determine if Amazon is a reliable source for reviews of different products, specifically aquarium products. These reviews have become very popular, but what are their pros and cons. So, do these pros or cons lean us to use the reviews or not? Some people think so, moreover I lean more to NOT SO MUCH. Understanding my aquarium background and the work I’ve already done on the subject of Amazon, anyone can figure out how I feel about Amazon. Lets get some understanding. The way Amazon has set up their website, it allows for anyone to come onto the site and leave a review any way they want. There are zero requirements for being able to leave a review, other than you have to have a log-in for Amazon. Amazon was one of the first to have this style of review format, and now many other retailers have followed in Amazon’s footsteps. Are these free-for-all reviews worth it though? The general format of the reviews are to first leave a star rating (1-5) of the overall product being reviewed. Then the customer (or non-customer) leaves verbal discussion on what they think about the product. Over time, these reviews add up and Amazon averages all these reviews to give an overall rating. Other users can then rate the review and also ask questions. Seems like a good idea, but what’s really happening? This format of reviews does give an idea of the quality of a product and what people are thinking about the use. A very quick reference can give a buyer a feeling of if the product is good or not. If there’s a consistent poor rating of a item, this would quickly be seen when checking the reviews. If there is overall success, this can also be seen quickly. Users can view the overall ratings or can spend some time reading the reviews from others. For a given product, someone can get some idea how the product looks, feels, and operates. Seems prefect right, so what’s the problem? In talking with many other aquarium keepers, being in the hobby for so long, and having experience with many aquarium products LONG-TERM, I’m finding hidden problems with these reviews. I strongly recommend using Amazon reviews as only a PART of your research, when determining if an aquarium product is right for you. Here are the cons. It’s a double-edged sword. Obviously, Amazon now sells home networking equipment. While the vast majority of reviewers have no technical expertise, the reviews themselves are valuable in aggregate when trying to determine things like failure rates. You simply cannot take individual reviews and utilize them in a specific manner because they don’t provide specific, technical information. However, a device that has 150 reviews that say “failed after 30 days”, there’s a good chance the device has manufacturing issues. The informed consumer would use that as a cue to go do more research before purchasing. Unfortunately, the opposite does not work. Dozens of positive reviews does not guarantee success for the individual consumer. Again, the utility of consumer reviews comes in aggregate. I understand that aquarium chemicals and things of that ilk are a different ballgame and unscientific reviews can be particularly damaging but there is a usefulness in consumer reviews that is better than not having any reviews at all. 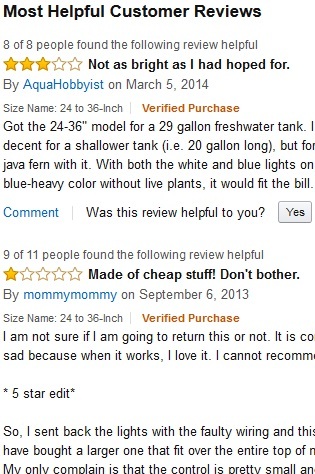 Please again, Amazon reviews should be only one aspect when researching aquarium products. Please consider other sources and look for reviews done by professionals with experience. Also, please consider using something other than Google to find these reviews. Google has been known to bring up user reviews like Amazons and burying quality reviews under websites, which Google brings to the top just to pay their bills. Consider using search engines such as https://www.duckduckgo.com/ for quality searches. Please see these cons to understand why I think this. One of the major problems to these Amazon reviews is how well a user gets to know the product, before they leave a review on it. There is no telling if they leave the review a week after they got a product or five years after. The use of the product is key to understanding it. We also don’t know if someone has just used the product once, or a few to many times unless they state it. More use of a product is BETTER. I guess the question comes down to, do you want to be taught from someone who’s a newbie or someone who has experience. Which of these people would you want to teach you CPR? I’ve found learning from people who have long-term experience, with many uses of a product, is far better than learning from someone with a one time use. Both prescriptive are important, but we need an understand of which prescriptive we are working with here, which Amazon only provides if reviewer states it. Some people have no real understanding what they are reviewing. They think they are helping, when in reality, they don’t know what they are talking about. Here’s a prefect example from a Review of The Current Satellite aquarium LED. The lack of understanding comes down to plants not needing bright lights, but USEFUL light. This user thinks the LEDs is a good one, because of the brightness of it. What the user doesn’t know, is you can have a not as bright LED, but have it have so much MORE useful light. Brightness doesn’t equal good for plants or corals. Someone without an understand, would think the bright LED is good. If this person asked someone with good experience, they would know, this is not good, but now Amazon is showing the product to be good. More over, this also leads into an understanding of not just the product, but the aspect of hobby. Something can have an overall rating of good, but when compared to other similar products, the item might be very poor. Using some simple science, these flaws can be spotted right away. Many more aspects can be brought into the understand of a product, which someone with little experience would know very little about. Take the LED example, where a cheap LED is rated 4 1/2 star on Amazon, but with other expert reviews on the product, they can show the cheap LED to be a poor quality compared to other LEDs. Instead of looking at lighting as a aspect, the product is the only aspect and the concept of quality lighting is missed. Another idea of these reviews is that it takes a “certain” type of person to leave these reviews. Not all people leave reviews and I’m not saying all people who leave a review are these type of “certain” people, but there’s also a feel to these reviews. All because of the people leaving the comments. Is it experts leaving quality reviews on Amazon or is it first time users, who spend a lot of time on the internet, prone to issue kind of people? Maybe people who get a sense of worth leaving reviews for others to see, which makes the person feel important. Does they lifelines depend on understand the product they are reviewing. Most likely not. The point being, we don’t know who’s reviewing. Which is why I strongly recommend getting reviews from people we can know more and know their history in the hobby, with their experiences. Amazon is a major retailer on the internet and have some serious ties to Google to make their webpages come up for many Google searches and advertising. Many times, Amazon is used, because they are considered the cheapest [which is not always true due to Amazon fees to the selling entity]. Know the down sides to buying on Amazon and buy with caution. If the purchase is something important, consider the support you get and if it’s worth the price. Reviews done by other customers are a resource for research if a product should be purchased. But really, it should only be used as one of the aspects of the research. Considering using other resources, which are quality, because of experience. If you are looking for a honest quality retailer, please look further than Amazon.com. This entry was posted in Aquarium and tagged Amazon, aquariums, Current LED Review, equipment, fish, LEDs, opinion, products, professions, reef, user reviews. Bookmark the permalink. Excellent article, something any aquarium keeper who is even thinking of using Amazon as a source of information or product purchase to read and then think again. I would also add that sometimes the reviews are misleading because a product can be changed by the company over time and now an once well make product is not so well made, or is different in some way. It might have gained a positive rating based on an older product that is no longer being made in the same way or with the same stuff.